So, sometimes we have these days. Lined up and started tail end of the field, had a good start. Carnage everywhere. 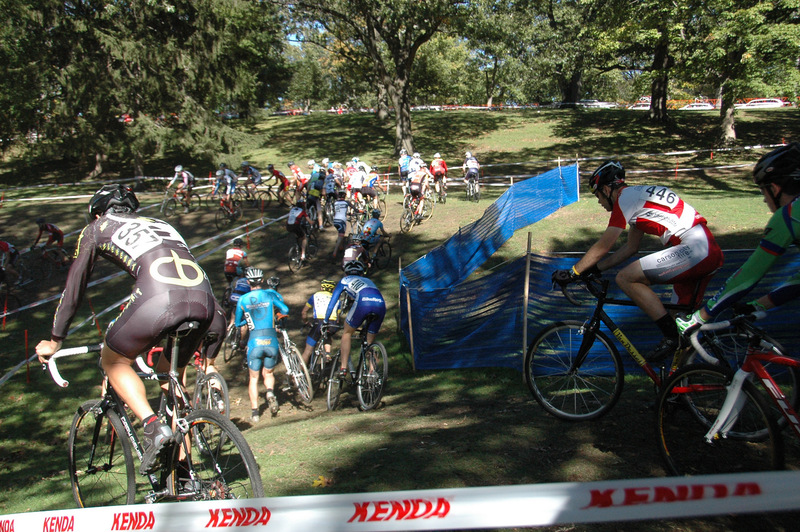 Literally someone was crashing or having a mechanical on every section of the course. I kept my head up and avoided the insanity and it was totally awesome. I wasn’t feeling super frisky today, but I was overtaking more riders than I ever have before, and I was definitely out of the cellar, staying out of trouble. Then. Then I’m being super aggressive on the off-camber descent back into the start/finish stretch, cutting it really tight to the point where I’m unclipped on the left to catch myself if I lose traction, and I roll the front tire. Wasn’t sure anything was immediately wrong since it popped itself back on, but by the time I hit the first turn of lap 2 I could tell it was f*cked. Just not enough pressure in it, and the tire rolled every time I turned the bars. I limped it into the pit, and was exceptionally casual and polite in asking if there were any neutral wheels, to which the UCI official responded “no there are not, and you can thank the race promoter for that”. Clearly having already dealt with this situation innumerable times – that was more or less the tone I picked up from that. To be honest, the pit official seemed more pissed off than I was. I got a friendly bystander to give me some air off his handheld compressor, but by the time I left the pit, it was hopeless. So that’s what tubulars are for. I endeavor to have some at some point in time. But tubulars notwithstanding, just straight-up pit wheels would have been a tremendous idea, particularly for a race I drove 2 hours to get to. My fault, and in spite of the pit official, I won’t blame the Providence race promoter. Too much. It was only going to be my best 3 field finish ever. But I drank some marginally potable beer at USB and got over it. Won’t be racing the Sunday race, so I’ll get a bit of recovery this week, and then be up in Portland on 10/16. On scale of 1 to FRISKY that one should be FRISKY. PVD is downright clincher-antagonistic. If the pavement transitions don't get you, the board covering the wires down by the Temple of Music will. Tubies are a royal pain but I must say there's a good reason why they're so popular in cross, and it isn't that we all like to huff Mastik 1 when we're not racing. That's just a side benefit. I'm liking the new blog theme, too. Insult to injury – when I limped out of the pit and pulled off the course for good, they were blasting Gonna Fly Now from the Rocky soundtrack at the Temple of Music. That was really inspirational, like if they had blown Rocky's leg off with a shotgun before he was getting into the ring to fight Drago inspirational. It's just bizarre in that I ran probably even less pressure both days at Gloucester without incident. But you're right, PVD has harsh, ill-conceived transitions. Not only that, but halfway down at least two of the steep embankments there are wheel-killing ruts I *usually* have the energy to bunny hop. I guess what I'm leaving with is a reminder that pressures just need to be a little higher here. PVD wasn't too kind to tubies, either, as I found out when I ripped open a brand new Griffo on the curb in the first turn. Race over in less than a minute. Still, tubulars, while pricey and labor intensive, are a HUGE performance upgrade for cross. Night and day difference over clinchers, which I ran last year. I was really surprised that a race of PVD's caliber had no neutral support, but then again, it's my responsibility to have spare wheels ready, really. And I had them, too.